Wild Yam (Dioscorea villosa) of the Dioscoreaceae (Yam Family), occurs from Texas to Nebraska to Minnesota and states eastward to the Atlantic Coast. In Arkansas, wild yam occurs statewide. The plant, a monocot (one seed leaf), is a twining vine which prefers a moist habitat, but will also grow in drier areas. Wild yam grows in a wide variety of habitats, ranging from borders of swamps, marshes, and lakes; to river and stream terraces; to open woodlands and savannas; moist, rocky, forested slopes; fencerows; and cleared easements. Preferring light sun to partial sun, it can survive in heavier shade, but it is less likely to flower. This deciduous, non-woody perennial grows from a thick rhizome which has been used for medicinal purposes. A mature wild yam plant in the spring can stand freely (three or more feet) until it reaches support to twine around. Multiple stems typically emerge from a single rhizome; some stems occasionally branch. Spring growth matures to slender stems without tendrils or stem rootlets. Wild yam climbs upward and outward seeking sufficient sunlight to spread out its leaves and to flower. Height of plants tends to be seven feet or less as determined by age and availability of sunlight; however, length may sometimes reach 15 or more feet. Stems are hairless (glabrous), varying from reddish with spring growth, then to green and yellow in fall. Young, vigorously growing spring growth tends to be angular or narrowly ridged in cross-section, becoming round as stems mature. 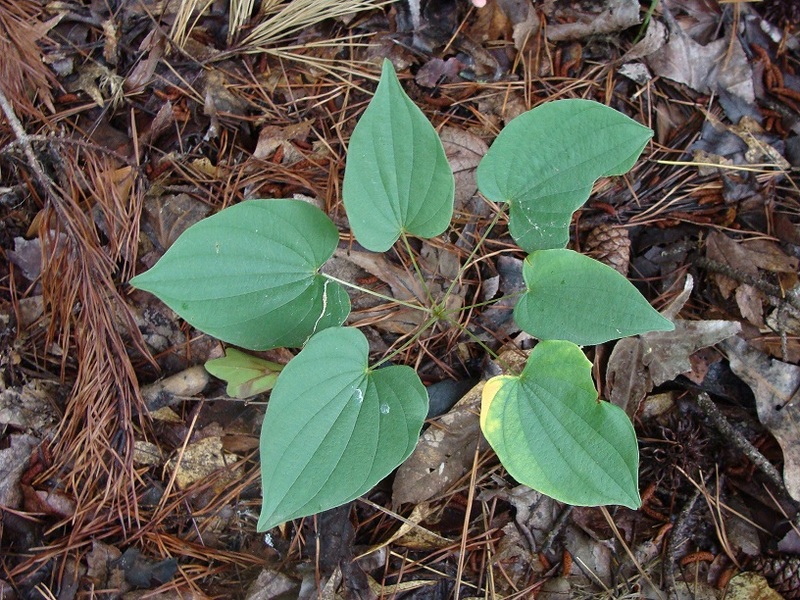 Leaves of wild yam are fairly uniform, but leaf arrangement varies on a plant and from plant to plant. Generally, whorls of five to six leaves are found near the base of the stem, with whorls of decreasing number of leaves extending up the stem, to the point that leaves sometimes become opposite but then eventually alternate toward the end of the vine. Leaves are narrowly cordate (heart-shaped) to more broadly cordate with smooth margins and palmate veins (radiating from central point). Veins (7-11 veins per leaf) extend from petiole attachment toward leaf margins and apex in an arcuate manner. The upper leaf surface is medium green and glabrous, while the lower surface is pale green and may be covered with sparse or dense short hairs (the epithet “villosa” meaning “hairy”). Slender petioles, which may be as long as the leaf blades, hold leaf blades upright for maximum sun exposure. Wild yam is dioecious (male and female flowers occur on separate plants). Flowers develop in early summer from leaf axils. Male flowers, occurring in panicles four to twelve inches long, are arranged in small clusters of two to three flowers along branches. A male flower, about 1/8″ across, consists of six whitish to yellowish-green sepals and stamens. Five to 15 female flowers are widely and individually spaced along dangling racemes that may be three to nine inches long. Female flowers, about 1/8″ across and 1/3″ long, consist of six whitish to yellowish-green sepals and a large inferior ovary with infertile stamens. Female flowers are replaced by three-celled, strongly angled (or winged), ovoid capsules that usually contain two seeds or one seed per cell. 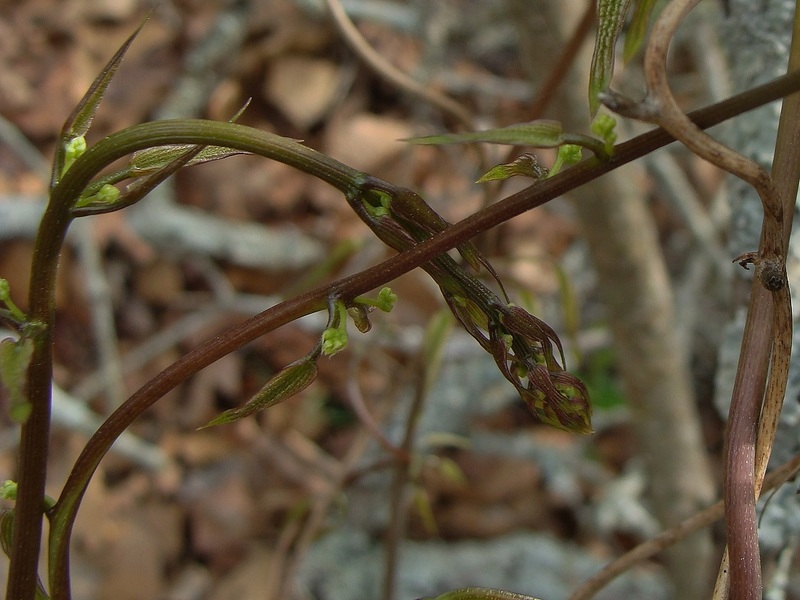 The capsules become golden-green and then brown with maturity and may remain on the plant into the following spring. Flattened seed have broad wings suitable for wind dispersal. 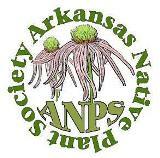 Notes: Wild yam (Dioscorea villosa) is the only native yam currently recognized in Arkansas. 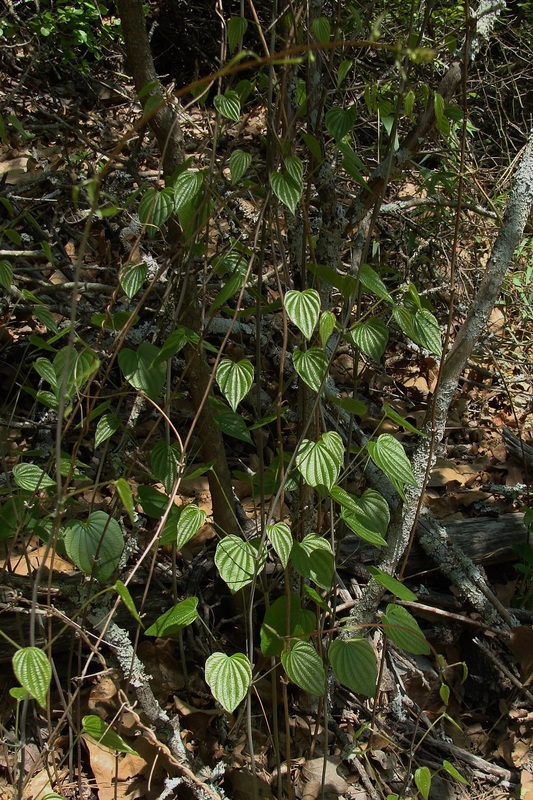 However, some authorities have recognized whorled wild yam (Dioscorea quaternata) as distinct from the aforementioned species based on variations in leaf arrangement, cross-section of stems, and appearance of rhizomes. 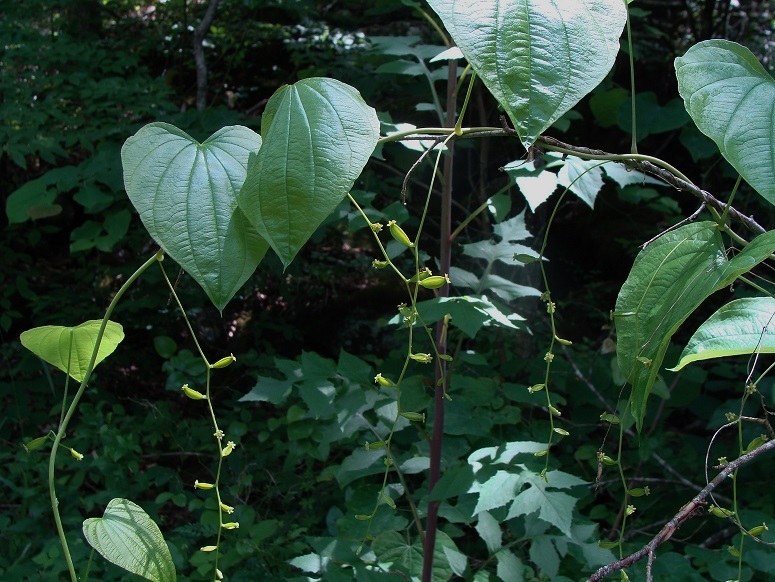 Also found in Arkansas is cinnamon vine or Chinese yam (Dioscorea polystachya), a non-native invasive plant now especially common on stream and river terraces throughout the upland areas of the state. Cinnamon vine grows from a tuber and has cordate to fiddle-shaped leaves which are usually alternate (sometimes opposite and very infrequently whorled). The majority of cinnamon vines naturalized in North America are male, thus sexual reproduction is rare. 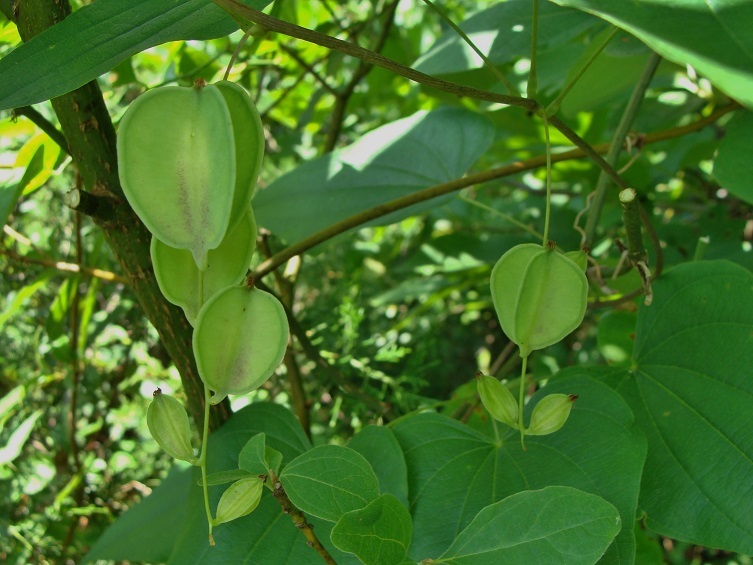 However, cinnamon vine spreads vegetatively via small, aerial bulbils (tubers) produced in the leaf axils, which are readily distributed by water. Photo 1: Early spring growth of wild yam. Note whorled leaves and smooth stems lower on plant and reddish stem at top of photo (see in Photo 2). Photo 2: Upper stems of a female wild yam plant. Note that upper portions are ridged, but becoming round as stem matures. Flowers developing in leaf axils. Photo 3: Flowering male wild yam supported by black gum and poison ivy. Photo 4: Flowering female wild yam supported by sassafras. Note characteristic leaf shape and venation. Photo 5: Female wild yam with developing seed capsules. Photo 6: Immature wild yam plant showing only basal leaves. NOTE: At this stage, may be confused with species in the Smilax genus, such as carrion flower (Smilax lasioneura) . 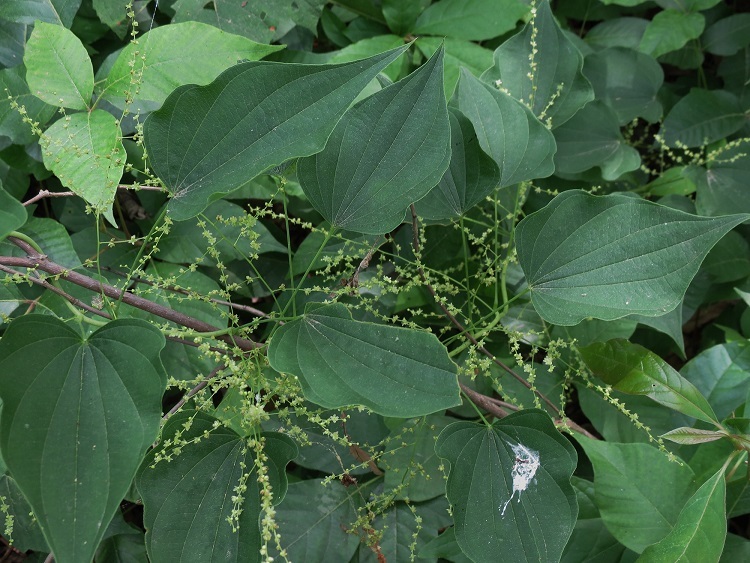 This entry was posted in Know Your Natives, Native Plants, Vines and tagged Dioscorea, Dioscorea villosa, Dioscoreacea, Wild yam. Bookmark the permalink.